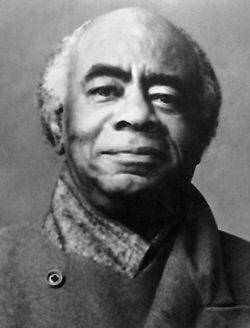 Actor, director, and narrator Roscoe Lee Browne was born on May 2, 1925 in Woodbury, New Jersey, the son of Sylvanus Browne, a Baptist minister, and Lovie Lee. A bright student who excelled in the study of literature, Browne graduated from Lincoln University in Pennsylvania in 1946 and did postgraduate work at Columbia University and the University of Florence in Italy. An outstanding track sprinter at Lincoln, he was twice named an All-American athlete and in 1949 won the Amateur Athletic Union (AAU) 1000 yard indoor championship. From 1952 to 1956 he worked as a sales representative for Schenley Import Corporation which brought foreign wines to the American market. Having only performed in a few high school and college stage shows, in 1956 Browne decided to pursue a career in acting. That same year he performed in Julius Caesar in New York City’s first Shakespeare Festival Theater. His work with the Shakespeare Festival Theater continued until he landed his first film role in The Connection (1961). Dozens of film roles followed including Black Like Me (1964), The Comedians (1967) and Topaz (1969). He starred in The Liberation of L. B. Jones (1970). In 1974, Browne played in one of his most memorable roles, the sleazy politician, Congressman Lincoln in Uptown Saturday Night. He was also a supporting actor in The Mambo Kings (1992). Browne’s numerous television credits include “Name of the Game” (1969), “Bonanza” (1972), “Starsky and Hutch” (1977), “New York Undercover” (1996) and “Law & Order” (2003). His awards include an Obie (1965), two Los Angeles Drama Critics Circle Awards for Best Actor (1970 and 1989) and a 1986 Emmy Award. In 1977 Browne was inducted into the Black Filmmakers Hall of Fame. Roscoe Lee Browne died of cancer in Los Angeles on April 11, 2007.